Elite Air Service Makes Maintenance to Float Planes Hassle Free...How can we help you??? Elite Air Service loves float planes. 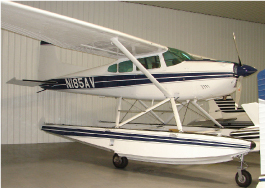 Our IA’s and A&P’s are experienced with amphibs and straight floats on aircraft from Kitfox to Beavers. 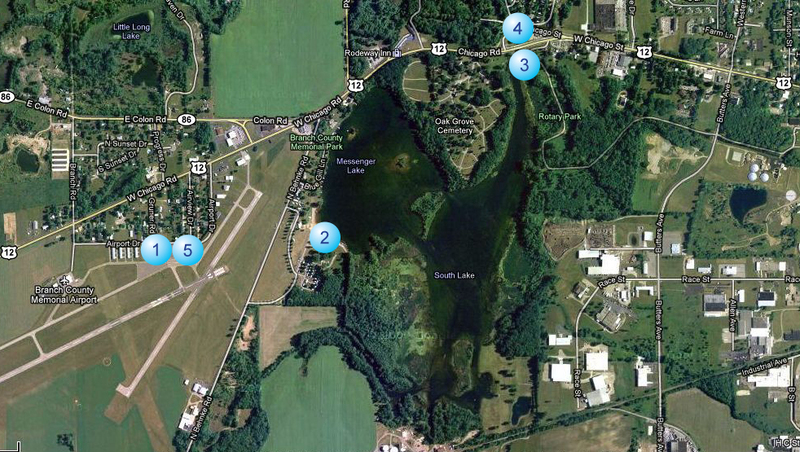 Messenger Lake is across the road from the airport and offers almost a mile of waterway for float equipped takeoff and landing. 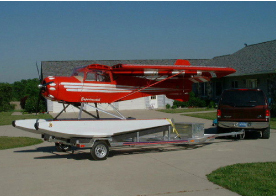 We can service your aircraft on the shore or dolly it to the hangar with a float plane and trailer. We can perform a full range of services to your aircraft without ever having to remove it from floats. Annuals, oil changes, interior refurbishment, paint touch up, engine repair or overhaul, leaky float repair, new float installations, and most other general aircraft maintenance is easily accomplished by our staff. We perform float change overs and we offer indoor or outdoor storage for your floats and/or your airplane. 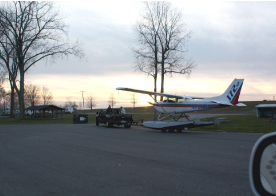 We over fuel service to the dock at Messenger Lake with AvGas, Jet A or MoGas. See the “SERVICES” tab for more information on float plane fuel. If you are hungry, here is a great little bar and grill right across the road called The Willows. We have a courtesy car available for your use and we can leave it waiting for you at the float plane dock if you call ahead. There are several motels and restaurants within 2 miles. 2. Beach Docking Area for Trailer Transport to EAS Hangar. 3. Docking Point for Float Plane Fuel Service (Public Lake Access Ramp). 4. Willows Bar & Grill Across the Road from Float Plane Fuel. Dockside fuel at Messenger Lake. 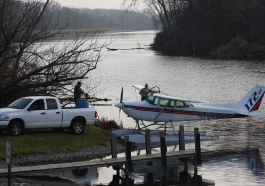 We fly float planes ourselves, we know how difficult it can be to get help with fuel, food, ground transportation, etc. Call us and tell us what you need...we are here to help!